The great steel skeleton sits high on our horizon and it seems to be moving quickly across what was once our view of the sky. Our bond with our sky, that is now so tragically eclipsed, is intense. These are the same skies that have given my children spectacular shows of double rainbows, lightening storms, distant rains drawing closer and starry moonlit nights. We are already at a disadvantage with our connections with nature, we live in one of the world’s biggest cities. Many children are growing up in our great city never having had the pleasure of watching a sunrise or experiencing the magical last moments of the day, as the sun slips below the horizon and we enter our time of rest. Of course, the forces of change are telling us that future generations will benefit from all this disruption. These huge structures will give something back to the children of our community. But, so much has been lost to these forces. So much disruption has entered our lives - like a constant headache – the pain does not seem to cease. It is difficult to see the future vision, when majestic trees have been lost, green land has been taken away and our beautiful view of the sky eclipsed. The loss of all these things has been soul destroying. I don’t think you have any idea just how profound our loss has been. When people are connected to nature, when they are connected to the seasons, through changing trees, rivers, light patterns, skies and the natural world around them – they are strong, healthy people. Our psyche’s need this connection to nature for our general well being. It is paramount that designers and planners keep this thought with them before constructing buildings, roads and facilities. They need to consider the well being of existing communities and the impact that huge structures will have on them. 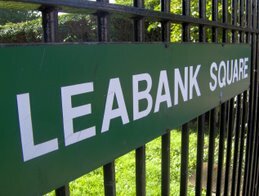 Our community here in Leabank Square has been much luckier than a lot of other communities also sharing this great city of ours. We live in one of the greenest places in inner London, with easy access to the canal networks, marshes, nature reserves and local parks. Sometimes I can’t believe just how privileged we are to experience things like watching carp fish return to our canal every Spring, flocks of starlings gathering in the Autumn or even learning how to row our inflatable boat. They seem like simple pleasures but these opportunities do not exist so readily for all Londoners. I feel truly connected to the world around me here in Hackney Wick – these bonds have made me and my family happier and healthier people. For those of you who live here and haven’t yet experienced just how beautiful and exciting our neighbourhood is I truly urge you to get out there to explore and enjoy this amazing corner of London we live in. It’s changing with each passing day and it may never be the same again! This is very moving and beautiful. You have put into words exactly how I feel about all the very quick changes going on around Leabank Square. This is so beautifully put. Our whole world has gone from lush green Arena Fields to concrete & steel in just a couple of years! No one has asked us how we actually feel about all this? What about the increasing feel of encroachment we all feel as the cliff face of developmeny gets higher & gloomier right outside our windows?! I dunno about anyone else, but I personally, I feel a major sense of doom & gloom. This is such a stunning way to put all our feelings about the Olympics down into words. Thank you. Why don't the Olympics read threads like this?! Instead they snoop around all the other discussions we have! Shame on them. Amen to all that folks. It seems that things have to change just for changes sake. The ODA come into the Wick & steal our green space, and what are they going to leave us with? Only time will tell. You've just said exactly how we all feel about this monstrocity growing opposite us! Where's a hurrican when you need it huh? ". . . Our bond with our sky, that is now so tragically eclipsed, is intense . . ."